There are two ironies in this World Cup 2014 as I could take it to history of World Cup tournament. First the story of goalkeepers and now the story of ex Manchester United players who are the key member of their squad in World Cup campaign. The first notable ex player of Manchester United is Cristiano Ronaldo, captain of Portugal and their ace attacker and the second one is Tim Howard, former goalkeeper. 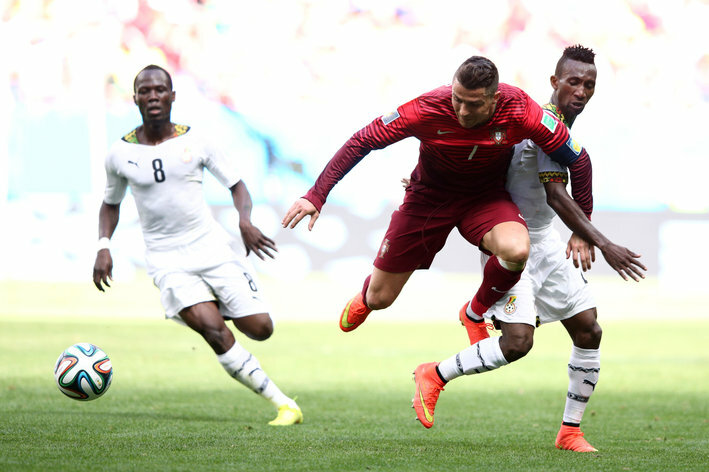 Ex Manchester United player Cristiano Ronaldo must be very upset this day although Portugal won the last group game against Ghana, Portugal cannot continue their World Cup 2014 journey. Lost to Germany and a draw against United States of America were not their campaign plan in Brazil. Portugal and Ronaldo is expected to qualify to the next round. Portugal is considered the better side if being compared with The Yankees. Luis Nani who played for Manchester United, Pepe who played for Real Madrid, and other player who played in the biggest league in Europe should not get this result. Portugal adding to other European nation who exit the tournament early. England with Wayne Rooney and Steven Gerrard knocked off from quadrennial tournament in worse result; one draw with Costa Rica and two loses against Italy and Uruguay. Spain the Champion also started the tournament unconvincingly. They lost two games (against Netherlands, and Chile) but Spain prove they quality in the last game against Australia by winning the game 3-0. Italy shocked the soccer fans around the world with their defeat by Costa Rica. Is European really cannot compete when the World Cup is outside their continents? Back to our topic about two ex Manchester United who had different luck in World Cup 2014. Tim Howard and the yankees are through to the knock out stage even tough they lost to Germany. America is not like the European team as I said before. Soccer is not their tradition. However they have quality of players who are playing with the best team in European league. Tim Howard recently played for Everton, London Donovan played for Totenham Hotspurs, Clint Dempsey is also play in English Premier League. Tim Howard made five saves in the match but Thomas Muller goal denied USA struggle for draw in rainy match. Tim Howard and USA squad progressing to Knockout Round with one win, one draw, and one lost. How does this two countries could turn around prediction of millions of soccer fans around the world? Does those countries cannot adapt to Brazil climate? or the statement of European cannot win the World Cup outside their continent is truly a true statement?